People injured on the job in Delaware may be eligible for workers' compensation benefits such as coverage for medical expenses, and temporary partial or total disability payments. However, not all workers' compensation claims are approved. Read on to learn some of the most common reasons insurance companies give for denying workers' compensation claims, as well as how an attorney can help injured workers fight for the benefits they need and deserve. The injury wasn't work-related. To qualify for workers' compensation benefits, the injury in question must have occurred while the person was at work or performing job-related duties. The worker waited too long to inform their employer of the injury. Delaware workers should notify their employer of an injury and request medical treatment—in writing—as soon as possible. The injury is due to a preexisting condition. Employees can't claim workers' compensation benefits for injuries that occurred prior to their employment. However, workers may be eligible for benefits if the job aggravated an existing injury. The employee was under the influence of drugs or alcohol, or was roughhousing or engaging in horseplay at the time of the accident and injury. Though the Delaware workers' compensation system isn't focused on finding fault, some employee actions can disqualify them from receiving workers' compensation benefits. The worker failed to seek medical treatment. If the injury was so minor that no medical treatment was necessary—and no medical documentation exists to support the injury—the insurance company may be reluctant to approve the claim. A workers' compensation claim may also be denied if the employee sought treatment from a doctor not on the employer's list of approved physicians. The employer disputes the claim. Paying out benefits to an injured worker can cause the cost of workers' compensation insurance to rise for the employer, which may lead some employers to deny even legitimate claims. 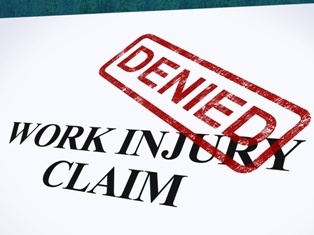 If your workers' compensation claim was denied, the skilled attorneys with the Morris James Personal Injury Group can help you appeal that decision and fight for the benefits you're owed. Contact us today to schedule an appointment for a free initial case consultation.